This roster compiled and maintained by Chris R. Toth. Roster last updated on April 22, 2019. 8314 CR 6051 PRRX 1882 05-1990 46247 NS LEADER/PTC Equipped. Unit currently stored, but still on the active roster. 8315 CR 6053 PRRX 1882 05-1990 46249 NS LEADER/PTC Equipped. Unit currently stored, but still on the active roster. 8316 CR 6056 PRRX 1882 05-1990 46252 NS LEADER/PTC Equipped. 8317 CR 6057 PRRX 1882 05-1990 46253 NS LEADER/PTC Equipped. Unit currently stored, but still on the active roster. 8318 CR 6058 PRRX 1882 05-1990 46254 NS LEADER/PTC Equipped. 8319 CR 6060 PRRX 1882 05-1990 46256 NS LEADER/PTC Equipped. Unit currently stored, but still on the active roster. 8320 CR 6061 PRRX 1882 05-1990 46257 NS LEADER/PTC Equipped. Unit currently stored, but still on the active roster. 8321 CR 6062 PRRX 1882 05-1990 46258 NS LEADER/PTC Equipped. Unit currently stored, but still on the active roster. 8322 CR 6064 PRRX 1882 05-1990 46260 NS LEADER/PTC Equipped. Unit currently stored, but still on the active roster. 8323 CR 6065 PRRX 1882 05-1990 46261 NS LEADER/PTC Equipped. Unit currently stored, but still on the active roster. 8324 CR 6068 PRRX 1882 05-1990 46264 NS LEADER/PTC Equipped. Unit currently stored, but still on the active roster. 8325 CR 6069 PRRX 1882 05-1990 46265 NS LEADER/PTC Equipped. 8326 CR 6070 PRRX 1882 05-1990 46266 NS LEADER/PTC Equipped. Unit currently stored, but still on the active roster. 8327 CR 6071 PRRX 1882 05-1990 46267 NS LEADER/PTC Equipped. 8328 CR 6073 PRRX 1882 05-1990 46269 NS LEADER/PTC Equipped. 8329 CR 6074 PRRX 1882 05-1990 46270 NS LEADER/PTC Equipped. Unit currently stored, but still on the active roster. 8330 CR 6076 PRRX 1882 05-1990 46272 NS LEADER/PTC Equipped. 8331 CR 6077 PRRX 1882 05-1990 46273 NS LEADER/PTC Equipped. Unit currently stored, but still on the active roster. 8332 CR 6078 PRRX 1882 05-1990 46274 NS LEADER/PTC Equipped. Unit currently stored, but still on the active roster. 8333 CR 6080 PRRX 1882 06-1990 46276 NS LEADER/PTC Equipped. Unit currently stored, but still on the active roster. 8334 CR 6083 PRRX 1882 06-1990 46279 NS LEADER/PTC Equipped. 8335 CR 6086 PRRX 1882 06-1990 46282 NS LEADER/PTC Equipped. 8336 CR 6088 PRRX 1882 06-1990 46284 NS LEADER/PTC Equipped. Unit currently stored, but still on the active roster. 8337 CR 6091 PRRX 1882 06-1990 46287 NS LEADER/PTC Equipped. Unit currently stored, but still on the active roster. 8338 CR 6092 PRRX 1882 06-1990 46288 NS LEADER/PTC Equipped. Unit currently stored, but still on the active roster. 8339 CR 6094 PRRX 1882 06-1990 46290 NS LEADER/PTC Equipped. Unit currently stored, but still on the active roster. 8340 CR 6097 PRRX 1882 06-1990 46293 NS LEADER/PTC Equipped. Unit currently stored, but still on the active roster. 8341 CR 6098 PRRX 1882 06-1990 46294 NS LEADER/PTC Equipped. 8342 CR 6099 PRRX 1882 06-1990 46295 NS LEADER/PTC Equipped. 8343 CR 6101 PRRX 1896 03-1991 46636 NS LEADER/PTC Equipped. Unit currently stored, but still on the active roster. 8344 CR 6102 PRRX 1896 03-1991 46637 NS LEADER/PTC Equipped. 8345 CR 6103 PRRX 1896 03-1991 46638 NS LEADER/PTC Equipped. 8346 CR 6105 PRRX 1896 03-1991 46640 NS LEADER/PTC Equipped. Unit currently stored, but still on the active roster. 8347 CR 6106 PRRX 1896 03-1991 46641 NS LEADER/PTC Equipped. Unit currently stored, but still on the active roster. 8348 CR 6108 PRRX 1896 03-1991 46643 NS LEADER/PTC Equipped. Unit currently stored, but still on the active roster. 8349 CR 6109 PRRX 1896 03-1991 46644 NS LEADER/PTC Equipped. Unit currently stored, but still on the active roster. 8350 CR 6110 PRRX 1896 03-1991 46645 NS LEADER/PTC Equipped. Unit currently stored, but still on the active roster. 8351 CR 6112 PRRX 1896 03-1991 46647 NS LEADER/PTC Equipped. Unit currently stored, but still on the active roster. 8352 CR 6113 PRRX 1896 03-1991 46648 NS LEADER/PTC Equipped. Unit currently stored, but still on the active roster. 8353 CR 6114 PRRX 1896 03-1991 46649 NS LEADER/PTC Equipped. Unit currently stored, but still on the active roster. 8354 CR 6117 PRRX 1896 03-1991 46652 NS LEADER/PTC Equipped. Unit currently stored, but still on the active roster. 8355 CR 6118 PRRX 1896 03-1991 46653 NS LEADER/PTC Equipped. Unit currently stored, but still on the active roster. 8356 CR 6120 PRRX 1896 03-1991 46655 NS LEADER/PTC Equipped. Unit currently stored, but still on the active roster. 8357 CR 6123 PRRX 1896 04-1991 46658 NS LEADER/PTC Equipped. Unit currently stored, but still on the active roster. 8358 CR 6124 PRRX 1896 04-1991 46659 NS LEADER/PTC Equipped. 8359 CR 6125 PRRX 1896 04-1991 46660 NS LEADER/PTC Equipped. Unit currently stored, but still on the active roster. 8360 CR 6127 PRRX 1896 04-1991 46662 NS LEADER/PTC Equipped. Unit currently stored, but still on the active roster. 8361 CR 6130 PRRX 1896 04-1991 46665 NS LEADER/PTC Equipped. Unit currently stored, but still on the active roster. 8362 CR 6131 PRRX 1896 04-1991 46666 NS LEADER/PTC Equipped. Unit currently stored, but still on the active roster. 8363 CR 6133 PRRX 1896 04-1991 46668 NS LEADER/PTC Equipped. Unit currently stored, but still on the active roster. 8364 CR 6135 PRRX 1896 04-1991 46670 NS LEADER/PTC Equipped. Unit currently stored, but still on the active roster. 8365 CR 6136 PRRX 1896 04-1991 46671 NS LEADER/PTC Equipped. Unit currently stored, but still on the active roster. 8366 CR 6137 PRRX 1896 04-1991 46672 NS LEADER/PTC Equipped. Unit currently stored, but still on the active roster. 8367 CR 6140 PRRX 1896 04-1991 46675 NS LEADER/PTC Equipped. Unit currently stored, but still on the active roster. 8368 CR 6141 PRRX 1896 04-1991 46676 NS LEADER/PTC Equipped. Unit currently stored, but still on the active roster. 8369 CR 6144 PRRX 1896 04-1991 46679 NS LEADER/PTC Equipped. Unit currently stored, but still on the active roster. 8370 CR 6145 PRRX 1896 04-1991 46680 NS LEADER/PTC Equipped. Unit currently stored, but still on the active roster. 8371 CR 6149 PRRX 1896 04-1991 46684 NS LEADER/PTC Equipped. 8372 CR 6150 PRRX 1808 02-1993 47184 NS LEADER/PTC Equipped. Unit currently stored, but still on the active roster. 8373 CR 6152 PRRX 1808 02-1993 47186 NS LEADER/PTC Equipped. 8374 CR 6153 PRRX 1808 02-1993 47187 NS LEADER/PTC Equipped. 8375 CR 6155 PRRX 1808 02-1993 47189 NS LEADER/PTC Equipped. Unit currently stored, but still on the active roster. 8376 CR 6157 PRRX 1808 02-1993 47191 NS LEADER/PTC Equipped. 8377 CR 6158 PRRX 1808 02-1993 47192 NS LEADER/PTC Equipped. 8378 CR 6159 PRRX 1808 02-1993 47193 NS LEADER/PTC Equipped. Unit currently stored, but still on the active roster. 8379 CR 6160 PRRX 1808 02-1993 47194 NS LEADER/PTC Equipped. 8380 CR 6165 PRRX 1808 02-1993 47199 NS LEADER/PTC Equipped. Unit currently stored, but still on the active roster. 8381 CR 6166 PRRX 1808 02-1993 47200 NS LEADER/PTC Equipped. Unit currently stored, but still on the active roster. 8382 CR 6168 PRRX 1808 02-1993 47202 NS LEADER/PTC Equipped. Unit currently stored, but still on the active roster. 8383 CR 6170 PRRX 1808 02-1993 47204 NS LEADER/PTC Equipped. Unit currently stored, but still on the active roster. 8384 CR 6171 PRRX 1808 02-1993 47205 NS LEADER/PTC Equipped. Unit currently stored, but still on the active roster. 8385 CR 6173 PRRX 1808 02-1993 47207 NS LEADER/PTC Equipped. Unit currently stored, but still on the active roster. 8386 CR 6174 PRRX 1808 02-1993 47208 NS LEADER/PTC Equipped. 8387 CR 6175 PRRX 1808 02-1993 47209 NS LEADER/PTC Equipped. Unit currently stored, but still on the active roster. 8388 CR 6176 PRRX 1808 02-1993 47210 NS LEADER/PTC Equipped. Unit currently stored, but still on the active roster. 8389 CR 6178 PRRX 1808 02-1993 47212 NS LEADER/PTC Equipped. Unit currently stored, but still on the active roster. 8390 CR 6180 PRRX 1813 06-1993 47395 NS LEADER/PTC Equipped. Unit currently stored, but still on the active roster. 8391 CR 6182 PRRX 1813 06-1993 47397 NS LEADER/PTC Equipped. Unit currently stored, but still on the active roster. 8392 CR 6184 PRRX 1813 06-1993 47399 NS LEADER/PTC Equipped. Unit currently stored, but still on the active roster. 8393 CR 6185 PRRX 1813 06-1993 47400 NS LEADER/PTC Equipped. 8394 CR 6187 PRRX 1813 06-1993 47402 NS LEADER/PTC Equipped. Unit currently stored, but still on the active roster. 8395 CR 6188 PRRX 1813 06-1993 47403 NS LEADER/PTC Equipped. 8396 CR 6189 PRRX 1813 06-1993 47404 NS LEADER/PTC Equipped. Unit currently stored, but still on the active roster. 8397 CR 6191 PRRX 1813 06-1993 47406 NS LEADER/PTC Equipped. Unit currently stored, but still on the active roster. 8398 CR 6195 PRRX 1813 06-1993 47410 NS LEADER/PTC Equipped. 8399 CR 6196 PRRX 1813 06-1993 47411 NS LEADER/PTC Equipped. Unit currently stored, but still on the active roster. 8400 CR 6197 PRRX 1813 06-1993 47412 NS LEADER/PTC Equipped. Unit currently stored, but still on the active roster. 8401 CR 6199 PRRX 1813 06-1993 47414 NS LEADER/PTC Equipped. Unit currently stored, but still on the active roster. 8402 CR 6200 PRRX 1813 06-1993 47415 NS LEADER/PTC Equipped. Unit currently stored, but still on the active roster. 8403 CR 6202 PRRX 1813 06-1993 47417 NS LEADER/PTC Equipped. 8404 CR 6205 PRRX 1813 06-1993 47420 NS LEADER/PTC Equipped. 8405 CR 6207 PRRX 1813 06-1993 47422 NS LEADER/PTC Equipped. Unit currently stored, but still on the active roster. 8406 CR 6209 PRRX 1813 06-1993 47424 NS LEADER/PTC Equipped. Unit currently stored, but still on the active roster. 8407 CR 6210 PRRX 1813 06-1993 47425 NS LEADER/PTC Equipped. Unit currently stored, but still on the active roster. 8408 CR 6211 PRRX 1813 06-1993 47426 NS LEADER/PTC Equipped. Unit currently stored, but still on the active roster. 8409 CR 6212 PRRX 1813 06-1993 47427 NS LEADER/PTC Equipped. Unit currently stored, but still on the active roster. 8410 CR 6214 PRRX 1813 06-1993 47429 NS LEADER/PTC Equipped. Unit currently stored, but still on the active roster. 8411 CR 6216 PRRX 1813 06-1993 47431 NS LEADER/PTC Equipped. Unit currently stored, but still on the active roster. 8412 CR 6218 PRRX 1813 06-1993 47433 NS LEADER/PTC Equipped. Unit currently stored, but still on the active roster. 8413 CR 6220 PRRX 1813 06-1993 47435 NS LEADER/PTC Equipped. Unit currently stored, but still on the active roster. 8414 CR 6221 PRRX 1813 06-1993 47436 NS LEADER/PTC Equipped. 8415 CR 6222 PRRX 1813 06-1993 47437 NS LEADER/PTC Equipped. Unit currently stored, but still on the active roster. 8416 CR 6225 PRRX 1813 06-1993 47440 NS LEADER/PTC Equipped. Unit currently stored, but still on the active roster. 8417 CR 6226 PRRX 1813 06-1993 47441 NS LEADER/PTC Equipped. Unit currently stored, but still on the active roster. 8418 CR 6228 PRRX 1813 06-1993 47443 NS LEADER/PTC Equipped. 8419 CR 6230 PRRX 1822 06-1994 47810 NS LEADER/PTC Equipped. Unit currently stored, but still on the active roster. 8420 CR 6231 PRRX 1822 06-1994 47811 NS LEADER/PTC Equipped. 8421 CR 6234 PRRX 1822 06-1994 47814 NS LEADER/PTC Equipped. Unit currently stored, but still on the active roster. 8422 CR 6235 PRRX 1822 06-1994 47815 NS LEADER/PTC Equipped. 8424 CR 6237 PRRX 1822 06-1994 47817 NS LEADER/PTC Equipped. 8425 CR 6240 PRRX 1822 06-1994 47820 NS LEADER/PTC Equipped. 8426 CR 6241 PRRX 1822 06-1994 47821 NS LEADER/PTC Equipped. Unit currently stored, but still on the active roster. 8427 CR 6243 PRRX 1822 06-1994 47823 NS LEADER/PTC Equipped. 8428 CR 6245 PRRX 1822 06-1994 47825 NS LEADER/PTC Equipped. Unit currently stored, but still on the active roster. 8429 CR 6248 PRRX 1822 06-1994 47828 NS LEADER/PTC Equipped. Unit currently stored, but still on the active roster. 8430 CR 6250 PRRX 1822 06-1994 47830 NS LEADER/PTC Equipped. Unit currently stored, but still on the active roster. 8431 CR 6251 PRRX 1822 06-1994 47831 NS LEADER/PTC Equipped. 8432 CR 6252 PRRX 1822 06-1994 47832 NS LEADER/PTC Equipped. Unit currently stored, but still on the active roster. 8433 CR 6254 PRRX 1822 06-1994 47834 NS LEADER/PTC Equipped. Unit currently stored, but still on the active roster. 8434 CR 6256 PRRX 1822 06-1994 47836 NS LEADER/PTC Equipped. 8435 CR 6257 PRRX 1822 06-1994 47837 NS LEADER/PTC Equipped. 8436 CR 6259 PRRX 1822 06-1994 47839 NS LEADER/PTC Equipped. Unit currently stored, but still on the active roster. 8437 CR 6261 PRRX 1822 06-1994 47841 NS LEADER/PTC Equipped. Unit currently stored, but still on the active roster. 8438 CR 6262 PRRX 1822 06-1994 47842 NS LEADER/PTC Equipped. 8439 CR 6264 PRRX 1822 06-1994 47844 NS LEADER/PTC Equipped. Unit currently stored, but still on the active roster. 8440 CR 6266 LMS 740 PRRX 1831 10-1994 48204 NS LEADER/PTC Equipped. Unit currently stored, but still on the active roster. 8441 CR 6268 LMS 742 PRRX 1831 10-1994 48206 NS LEADER/PTC Equipped. 8442 CR 6269 LMS 743 PRRX 1831 10-1994 48207 NS LEADER/PTC Equipped. 8443 CR 6271 LMS 745 PRRX 1831 10-1994 48209 NS LEADER/PTC Equipped. Unit currently stored, but still on the active roster. 8444 CR 6273 LMS 747 PRRX 1831 10-1994 48211 NS LEADER/PTC Equipped. 8445 CR 6274 LMS 748 PRRX 1831 10-1994 48212 NS LEADER/PTC Equipped. Unit currently stored, but still on the active roster. 8446 CR 6276 LMS 750 PRRX 1831 10-1994 48214 NS LEADER/PTC Equipped. Unit currently stored, but still on the active roster. 8447 CR 6278 LMS 752 PRRX 1831 11-1994 48216 NS LEADER/PTC Equipped. Unit currently stored, but still on the active roster. 8448 CR 6279 LMS 753 PRRX 1831 10-1994 48217 NS LEADER/PTC Equipped. Unit currently stored, but still on the active roster. 8449 CR 6281 LMS 755 PRRX 1831 11-1994 48219 NS LEADER/PTC Equipped. 8450 CR 6283 LMS 757 PRRX 1831 11-1994 48221 NS LEADER/PTC Equipped. 8451 CR 6285 LMS 759 PRRX 1831 11-1994 48223 NS LEADER/PTC Equipped. 8452 LMSX 712 NS 1828 08-1994 48116 NS LEADER/PTC Equipped. Unit currently stored, but still on the active roster. 8453 LMSX 713 NS 1828 08-1994 48117 NS LEADER/PTC Equipped. Unit currently stored, but still on the active roster. 8454 LMSX 714 NS 1828 08-1994 48118 NS LEADER/PTC Equipped. Unit currently stored, but still on the active roster. 8455 LMSX 715 NS 1828 08-1994 48119 NS LEADER/PTC Equipped. 8456 LMSX 716 NS 1828 09-1994 48120 NS LEADER/PTC Equipped. Unit currently stored, but still on the active roster. 8457 LMSX 717 NS 1828 09-1994 48121 NS LEADER/PTC Equipped. Unit currently stored, but still on the active roster. 8458 LMSX 718 NS 1828 09-1994 48122 NS LEADER/PTC Equipped. Unit currently stored, but still on the active roster. 8459 LMSX 719 NS 1828 09-1994 48123 NS LEADER/PTC Equipped. Unit currently stored, but still on the active roster. 8460 LMSX 720 NS 1828 09-1994 48124 NS LEADER/PTC Equipped. Unit currently stored, but still on the active roster. 8461 LMSX 721 NS 1828 09-1994 48125 NS LEADER/PTC Equipped. Unit currently stored, but still on the active roster. 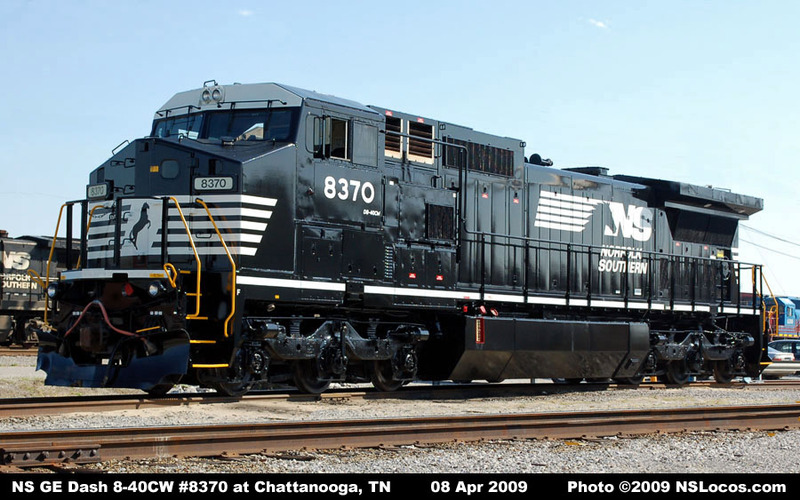 8462 LMSX 722 NS 1828 09-1994 48126 Unit stored following wreck at Chattanooga, TN. 8463 LMSX 723 NS 1828 09-1994 48127 NS LEADER/PTC Equipped. Unit currently stored, but still on the active roster. 8464 LMSX 724 NS 1828 09-1994 48128 NS LEADER/PTC Equipped. Unit currently stored, but still on the active roster. 8465 LMSX 725 NS 1828 09-1994 48129 NS LEADER/PTC Equipped. 8466 LMSX 726 NS 1828 09-1994 48130 NS LEADER/PTC Equipped. 8467 LMSX 727 NS 1828 09-1994 48131 NS LEADER/PTC Equipped. Unit currently stored, but still on the active roster. All units are equipped with air conditioning. electronic fuel injection and addition of external radiator shutters. Units 8419-8451 originally equipped with electronic fuel injection. Units 8419-8467 built with larger Dash 9 style radiators with split cooling. Cab signals and LSL have been removed from all units. Please Note: This is the personal website of Chris R. Toth. 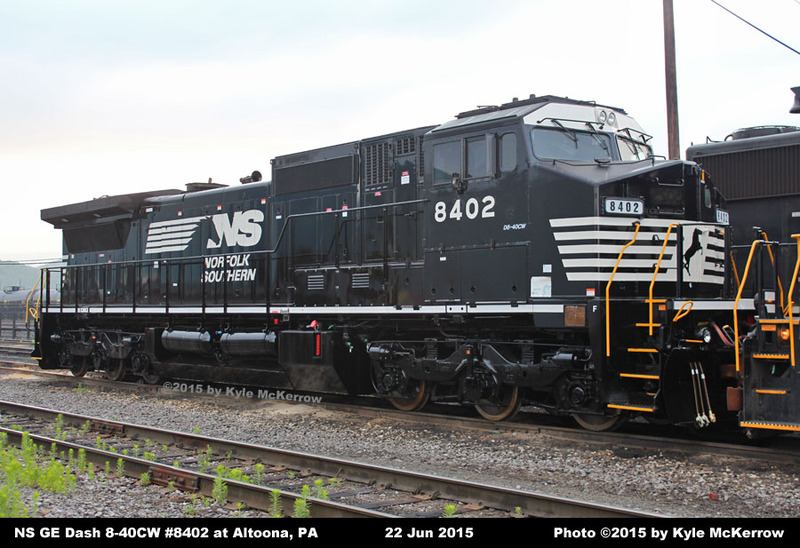 It is not affiliated with, sponsored nor supported by Norfolk Southern Corporation. Information and photos from this website should not be used without permission and/or proper credit.